Here comes the baap of albums that have come this year. This for sure is the one everyone had waited for and this for sure is the one that would not disappoint. It has experimented with both Music and lyrics. Even if this album is not played often and remembered for long, this would be one of my favourite for this year and for the time being for sure. It makes me feel elated. Especially Lyrics by Gulzar are awesome. I dont know who else could write a poetic song on AIDS or a Poetry using the word "Kaminey". Vishal Bhardwaj reserves his best music for Gulzar's films and Gulzar reserves his best lyrics for Vishal's. The Album starts with a very upbeat "Dhan te Nan". The song starts with a solo trumpet and then the beats carry it into a beautiful flow, the moment when they sing "Dhan Te Nan" you feel like smiling. It is sung beautifully by Vishal Dadlani and Sukhvinder sing. Its wonderful how both of them complement each other, like another song where Kailash Kher does the same. No one could have used English and Hindi in such a nice sync. Its evident also in his thoughts when he says life is like a "one way" and there is only one chance. Also in the second stanza(3:50)there is one thing that I liked. "Kai Kabre hai, Kai Khabrein Hai...". This song is a blast for sure. Next on the list is "Fatak". Just like the song before, you can see how Kailash Kher's voice can mix into Sukhvinder's voice, at times I forgot who is singing what. It has a beautiful sound of the whip "Fatak" and solid drums playing in the back ground. It is what makes Vishal Bhardwaj's Music so special and so earthy. Keedo ki basti ka makoda hai .... "
And at the end Gulzaar saab tells us what Bhanwara is through the most famous sher " Ye ishq nahi aasan, AIDS ka khatra hai ..."
Message : Ke Naiya Dube na, ye Bhanwara Kaate na. Then comes the GO Charlie Go theme and I assume that this would merge well with the story for "Fahid Kapur's" acts. It sounds a little like a background score of a thriller / mystery movie. Midway it starts with the "Dhan Te Nan" extension and it sounds very much like the 80s thriller after that. This would look better after the movie is released. Then is one of the most beautiful compositions - The Title track. EK Dil se dosti thi, ye huzoor bhi Kaminey. (Vishal Bhardwaj's vocal suits Kaminey in a very poetically painful way here. It somehow reminded me of No Smoking songs). 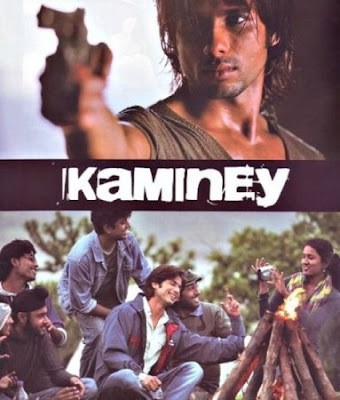 Jeene Ke sab Karine, The Hamesha se Kaminey"
Kabhi hum Kaminey nikale, Kabhi doosre ..... Kaminey"
Hail Gulazaar saab, Hail Vishal for not just composing this beautifully but singing it in such an intoxicating way. It is not full of pathos, but its full of feeling of pain and betrayal that can come from heart and can make the word soothing. Next comes something for the slow song fans, the Mohit Chauhan club. I like this song though it isnt something that is out of the league. It is very much the usually beautifully romantic song in between an extraordinary album. "Dil Ne kaisi Harkat Ki hai, Pehli baar mohabbat ki hai, Aakhiri baar Mohabbat ki hai" . Ye Barkat un Hazrat ki hai...... Pehli baar Mohabbat ki hai..."
Tanhai ne fursat di hai.... pehli baar mohabbat ki hai..."
Vishal Bhardwaj happens to be one of my favourite personalities in the world of cinema, and I await his work in all faculties. It is like listening to someone, who worships the medium. And Kaminey just makes you feel so much better about him. You might compare these tracks with his earlier works "Omkara", "U Me aur Hum" or even "No Smoking" and "Maachis" but all his works stand out in the crowd on their own. They are like different human beings. You cannot say one is better than the other. Songs I am sure apart from the beauty they show now are also situational and would make the movie a lot better. Its a Vishal Bhardwaj- Gulzaar Album, with their classic flavors, so we dont need a review to grab this one. Its sure to please you. I am not qualified to rate this but on my liking scale it is 8.5 out of 10.